New: Ten Steps to Improving College Reading Skills, 7/e! Ten Steps to Improving College Reading Skills, 7/e! No series has helped more students build college reading skills than Ten Steps. And no textbook has had a greater impact than Ten Steps to Improving College Reading Skills. 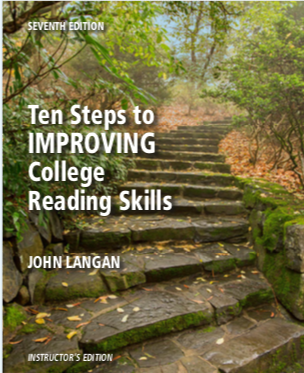 Crafted for students reading at levels 8-12, Ten Steps to Improving College Reading Skills is proven to help master the reading skills needed for success in the college classroom and beyond. Available with Ten Steps Plus, a collection of digital resources that includes assessments, lively practice items, interactive mastery tests, bonus readings, and a 100-title ebook library! Write us at cs@townsendpress.com or call (800) 772-6410.